A 42-year-old woman was referred to our department with a 5 months history of intermittent fever and fatigue. Her past medical history included a consolidated diagnosis of sarcoidosis (obtained 7 years before with a sub-carinal lymph node biopsy) and in the previous years she had been treated with steroids, hydroxychloroquine, methotrexate and azathioprine with persistent and progressive enlargement of mediastino-hilar adenopathies and bilateral nodular infiltrates. Her symptoms progressed despite a course of antibiotics prescribed for presumed community-acquired pneumonia and a course of corticosteroids. The patient lived in Italy and there was no history of travels or other additional risk factors for infections. At the time of admission, the patient had a temperature of 38.5°C and the physical examination was only notable for hepatomegaly and splenomegaly. A white blood cell count showed lymphopenia (0.39×10^9/l, CD4+ 0.22×10^9/l) and anaemia (Hb 10.4 g/dl, MCV 78.7 fl). CT images of the thorax revealed bilateral nodules of variable sizes predominantly in the upper lung fields and a positron emission tomography showed several areas of increased metabolism in the liver, spleen, lymph nodes (above and under the diaphragm), D3 vertebra and bilateral nodular infiltrates (figure 1). 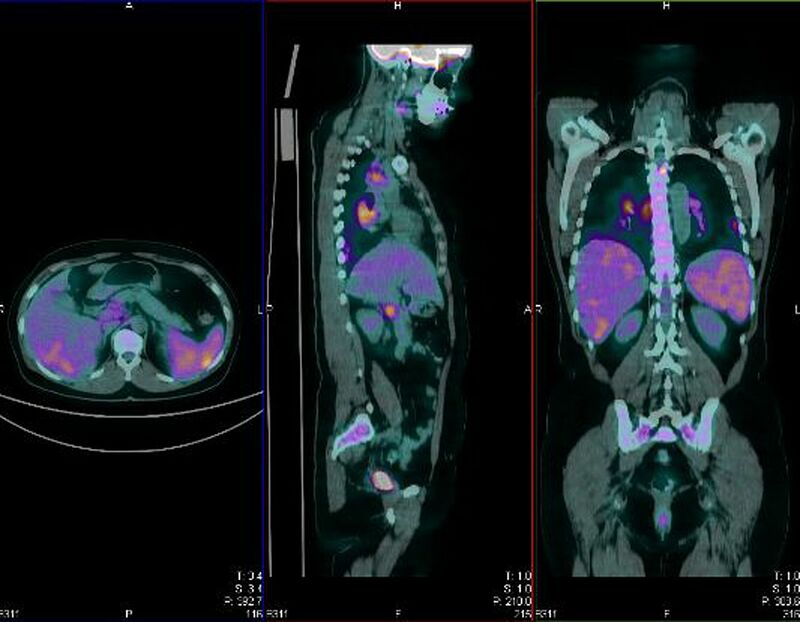 CT/PET showed numerous areas of increased metabolism in the liver, splenic parenchyma, thoracic and abdominal lymph nodes. Fibre-optic bronchoscopy was normal and all investigations for infections (blood, bronchoalveolar lavage, urine and serological tests) were negative. ECG was normal. 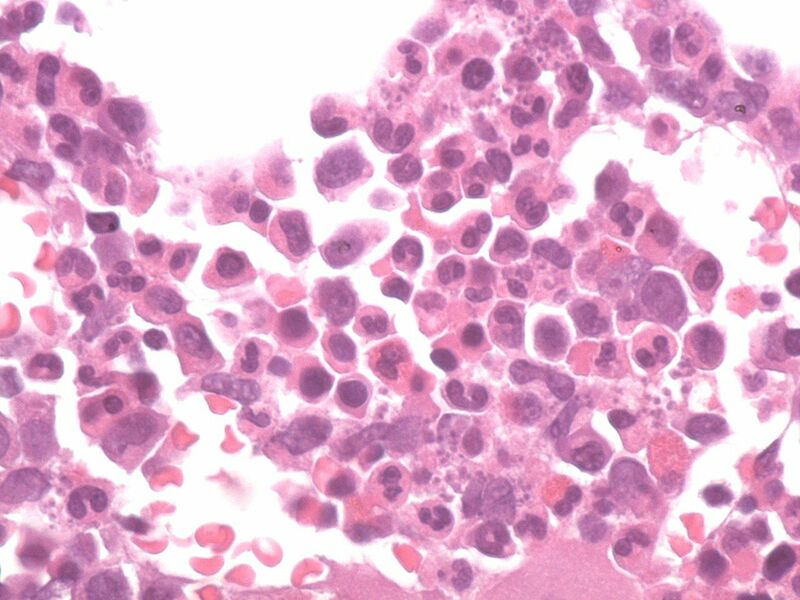 A bone marrow biopsy was performed: the perivascular region was characterised by a concrete number of polyclonal mature plasma cells (for κ and λ light chains of immunoglobulins) and a diffuse interstitial infiltration of foamy macrophages with intracellular inclusions was noted as showed in figure 2. Bone marrow biopsy showing diffuse interstitial infiltration of foamy macrophages containing Leishmania protozoa. The pathological analysis of the bone marrow revealed diffuse interstitial infiltration of foamy macrophages containing Leishmania protozoa. The conclusive diagnosis was visceral leishmaniosis in immunocompromised patient. The patient was treated with liposomial amphotericin (3.5 mg/kg for 5 days and then with a maintenance dose); treatment was well tolerated and resulted in immediate regression of the fever and improvement in general state of health; C-reactive protein decreased from 87 mg/l to 24 mg/l and lymphocytes increased from 0.39 mg/l to 0.95 mg/l.
. Prolonged fever, hepatosplenomegaly and pancytopenia in a 46-year-old woman. PLoS Med 2009;6:e1000053.
. The relationship between sarcoidosis and lymphoma. Eur Respir J 2010;36:1207–9.
. Fungal infections as a complication of therapy for sarcoidosis. QJM 2005;98:451–6.
. Evaluation of a rapid immunochromatographic test for diagnosis of kala-azar & post kala-azar dermal leishmaniasis at a tertiary care centre of north India. Indian J Med Res 2005;122:485–90.
. Leishmania infection in a 51-year-old woman with sarcoidosis: case report. APMIS 2006;114:825–7. Ethics approval Ethics approval was provided by Area Vasta Romagna Review Board.